SCAMP Camp is over for this year. The plywood kitsets and all of the consumables were delivered two weeks ago , the benches and all the consumables set up, one of each of the building jigs and shop manager Scott had everything ready to roll. Two weeks later 6 boats were wheeled out by their excited owners. Its like watching your children leave home when the trailers are all loaded and the cars head off out of the North West Maritime center with the fat little boats following along behind. 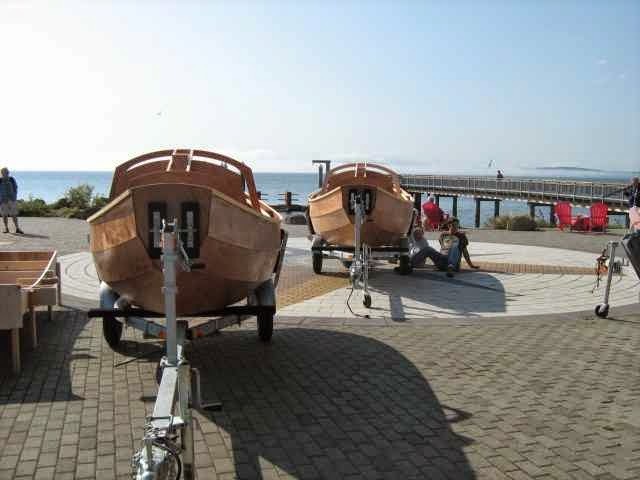 New friends head away to finish their boats, hopefully to be back next year to participate in the next “Red Lantern Rally”. This course went really well, we as instructors have learned from previous courses, we’ve developed the sequence and the methodology for assembling the kits, have bought tools that speed things up, Scott Jones of the Maritime Center brought his organisational skills to the class and it went so well that we could afford the time to take the middle weekend off to attend the inaugural Red Lantern Rally. To explain, the SCAMP, being designed and promoted as a small boat with camping capability has a red hurricane lamp as a sail emblem, hence the “Red Lantern Rally” which is an annual event for SCAMPers . I expect to be there to chase him down the course, I’ve had an offer of a boat to be built to my experimental “Saturday Night Special” design (I do hope it works), and hope too that the fates conspire to enable it to happen. The classroom at the North West Maritime Center is a really nice place to work, well lit with natural lighting, wooden floor to ease the aching feet, plenty of space and a wonderful view out over the water to remind us why we're building boats. A geat place, 10/10! This shot was taken first thing on Wednesday morning, a lot of progress to show for only two days of work. 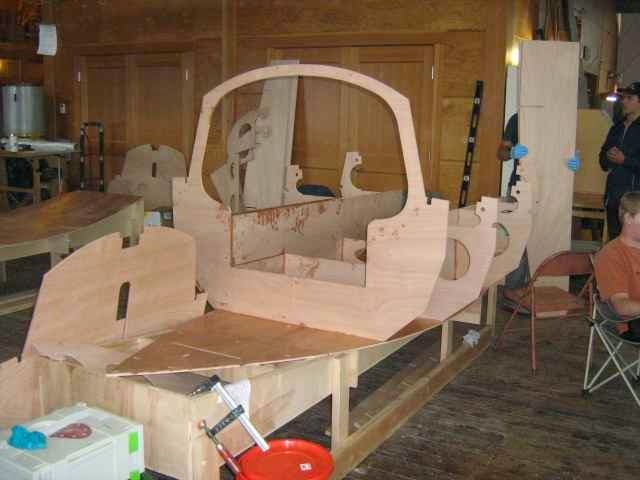 Here we see the centercase, fiberglassed inside, with frames 4, 5, 6 & 7 set up on the bottom panel, the water ballast tank being that space behind the first frame in this pic, and the panel being held up behind is the port side mate to the starboard side seat front that forms one side of the offset centercase . 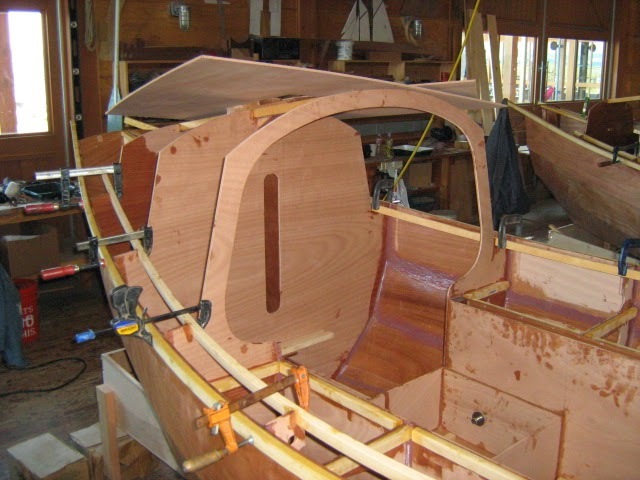 By that evening the transom was on, everything glued in and the forward frames and bow ready to set up. 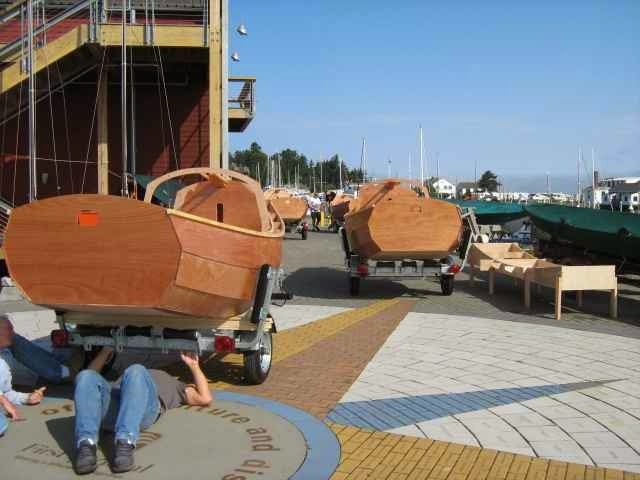 Back to Port Townsend, I have to say thanks to the North West School of Wooden Boatbuilding who have run the SCAMP Camps here in Port Townsend. They have contributed a great deal to the development of the SCAMP class, to the SCAMP kit development and to the way that the build classes happen. This years course was the last one that they will be involved in, and the ball will in future be carried by Small Craft Advisor Magazine, Howard Rice and myself through the “Small Craft Skills Academy” (link above) and will be run at several different venues around the USA and possibly other countries as well. Thank you NW School, thank you interim Director David Blessing, thanks to the school board and staff, and thanks to then Director Pete Leenhouts for supporting the class and the SCAMP. A few days later the boats have been planked up, the outer rubbing strakes are on and here we are putting the inwales on. They support the side decks and the coamings ( seat backrests) and add considerable strength to the boat. Most of the places inside the boat that will be difficult to access later have been sealed with epoxy resin, the glue joints reinforced with epoxy fillets and items such as the centerboard pin are in place. 10 working days after we all trooped upstairs to brief the class we're loading the trailers and watching the guys prepare to tow home, some travelling thousands of miles to get back to the the temporary shipyards, otherwise known as Garages, where the boats will be completed. Ready to hook up and head out. Both rewarding and sad, new friends left behind, but all of us hoping to see each other next year at SCAMP Skills, or the Red Lantern Rally. Port Townsend has become a sort of second home, I’ve been here several years in succession now courtesy of the SCAMP Camp boatbuilding program and help from the likes of Helen and Pete Leenhouts who host me while I’m here, Josh Colvin of Small Craft Advisor Magazine and lots of friends who make the place so welcoming. I find that I know where to buy the things that I need, right down to knowing which aisle in the supermarket has my favourites, and where in the hardware store I’ll find the bits and pieces that I need. I pitched in to help Howard Rice with the SCAMP Skills class, four boats and I think 8 or 9 students. A good group of people, and we had a blast! Lots of time on the water, some classroom time to look over theory, safety demonstrations, and a little voyage or two with a picnic lunch. 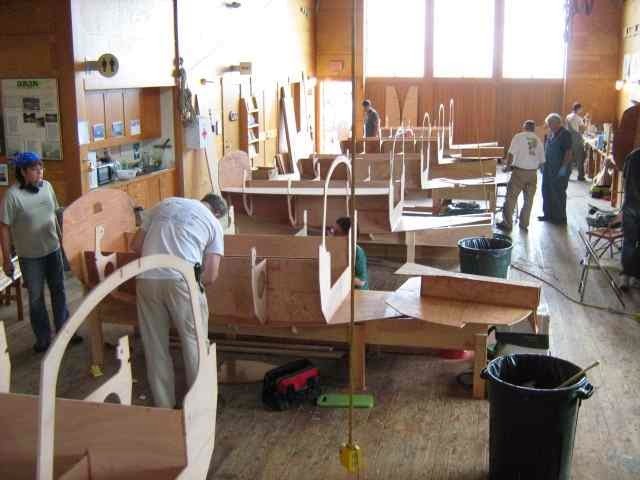 Great fun, and a perfect primer before heading into the North West Maritime Center for the beginning of the boatbuilding class we call SCAMP Camp. Phil McGowan in his drysuit, ready for man overboard practice. The water is cold up here. While the boat is very stable and resistant to capsize, it is an open boat so its still possible to tip one over. Safety being paramount we're experimenting with reboarding techniques and that line along the side is part of the experiment. It works a treat and we're looking at refining it and incorporating it in to the SCAMP Credo. 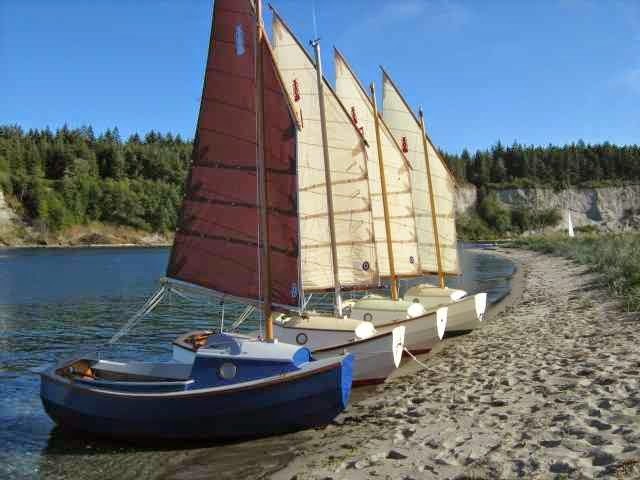 Four SCAMPs lined up on the beach at Rat Island across from Port Townsend, two boats make a race, four make you work even harder, but all in good humour. We’re building SCAMPs of course, the little 11ft 11in camping cruiser designed for Small Craft Advisor Magazine, a boat which is very close to achieving 300 plans and kits sold. 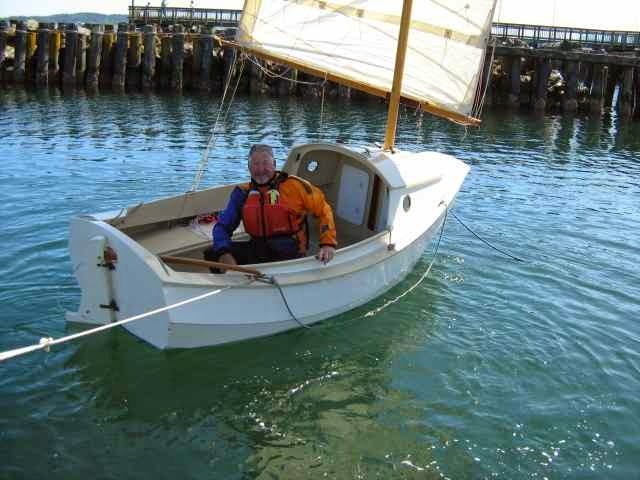 The boat is close to cult status now, and due to the efforts of Howard Rice the class is also a registered national class boat with US Sailing which is remarkable for a home built boat. ( Yes, Gig Harbour Boats make a fiberglass one, but most are plywood home builds). The class is going really well, shop manager Scott Jones had the place well organised when Howard and I arrived on the Monday, and between us and a very good group of people we’ve made really good progress. At the end of day five we had just hung the lowest plank, two more to go on each side then we’re into the smaller pieces before dry fitting cabin sides, top and the decks. Happenings in the classroom, if you had to go back to school what better subject could there be. This is the morning of day three and the pre cut kitsets are going together really well. At this stage the centercases have been fiberglassed inside and assembled, they are installed and frames four through six are in, the seat fronts and stern transoms are on, and the next step is to assemble the mast box and frame/bulkhead four ready to drop the stem in and B#4 and mast box onto that. We used the Makita builders cross laser level featured a while back in this blog to keep things straight and level, its a major time saver! Well done Makita San. We're also using a Ryobi cordless brad nailer, a brad being a small finishing nail, and thats another major timesaver. I'll give you my detailed impression of that later on. I’m finding that I’m doing much better than last year, have not had to excuse myself for a break each day to stay on my feet which is a big improvement, although I can tell you that I’m sleeping like a log at night and will be pleased to have a day or two off at the end of the course. The big news about SCAMP Camp is that Howard and I are looking hard at the possibility of other venues, Port Aransas in conjunction with next years PlyWooden Boat Festival being the leading contender at present, and if that goes ahead we’d be planning to run a sailing school academy class as well as other skills classes in conjunction with it. That should be fun, we’d be needing super slow hardener for the epoxy resin though as its much hotter there on the South Eastern corner of Texas than it is here in the Pacific North West. We’re off in a few minutes to attend the “Red Lantern Rally”. SCAMP, being a camping capable small boat has a red hurricane lamp as its sail emblem, hence, the name of the rally. We’re expecting 10 or 12 of the fat little boats there, and it looks like being a lot of fun. I'm in Port Ludlow Washington in the Pacific North West of the USA. Travel is great, they say it broadens the mind but I find that I eat more than I should so in my case it broadens the belly. Its really nice to connect with familiar places and friends, but there are times when being so far from home is not where you want to be. Like this morning, Daughter Sarina has been waddling around heavily pregnant, was a week overdue when I flew out and I’d been a bit concerned as to the well being of mother and baby. But baby Kiani Denny Maia Clark arrived very early this morning. So I’m a granddad again, another little girl to love and spoil. Congratulations to Sarina and husband Alby, and a hug for 5 year old big sister Aysha. ( I can still fold nappies ( diapers ) as well as the next guy, I suspect that might be useful). My friend Chuck Leinweber once said to me that if he’d known grandchildren were going to be so much fun he’d have had them first. There is a lot in that. It’s a long way to Tipperary the old song says, but I can tell you that the cheap flights from Auckland to Seattle makes for an even longer journey, Auckland to Brisbane, Brisbane to Los Angeles, LA to Seattle takes around 24 hours including “terminal time”. Brisbane is not so bad, they have a transit area so there is no need to go out through Immigration and customs then back as LA forces passengers coming from Vancouver BC ( Canada) and transferring to a flight out to NZ or Aussie as they did to me a few years back. But they do run everyone who’s just come off the plane through the security scan and inspection again, as if they’d not done that to get on the incoming flight. Ah well! Nowt I could do about it and the officials were polite and efficient. LA international airport though lived up to its reputation as one of the worlds worst regarded major airports, there were over 2000 people in the queue for immigration and customs, it took an hour and a half to get through that, and as I know the place of old I’d asked my travel agent to book flights such that I had extra time between incoming and my connection so I had plenty of time to deal with the vagarities of the place and not miss my outgoing plane to SeaTac in the north. As usual the place was filled with great crowds of stressed and unhappy people, and that’s just the staff! Queues of 50 or more at Starbucks and Burger King so no chance of getting even that kind of food. It was to be 3 ½ hours more flying to get to the next chance of refuelling myself and no food on that flight so it was back to my reserve packet of muesli bars and a bottle of water from a coin machine. So I’m here in Port Ludlow, home of several friends including my hosts Helen and Pete Leenhouts. I’ve about got over the jetlag, coming from New Zealands winter where its dark at about 5 30 pm to here where its still light at 9 30 is as much of a shock to the system as the time zone difference, the body keeps saying its not bedtime yet and its very hard to get up in the morning. That will only last another day or so, and I’m in summer which is nice. It will be springtime when I get back home which will be a treat, this will be a good summer with lots of time out on the water. 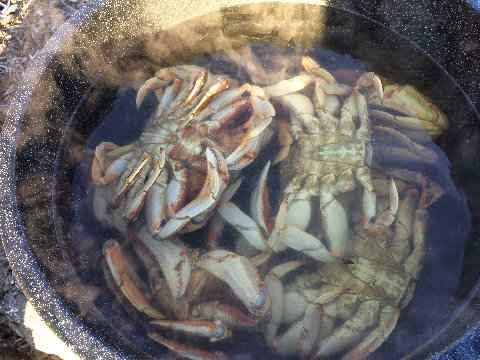 I got out on the water the very day I arrived here, Petes friend Ed Davis has a little 12 ft aluminium boat with a 9.9 hp Honda outboard on it, and goes out hunting Dungeness Crab just off the shore where he lives, so I got a ride out to help pull traps. Those are big crabs, shells about 150mm across and two full handspans across the legs, they are capable of breaking fingers if they get you with their claws. 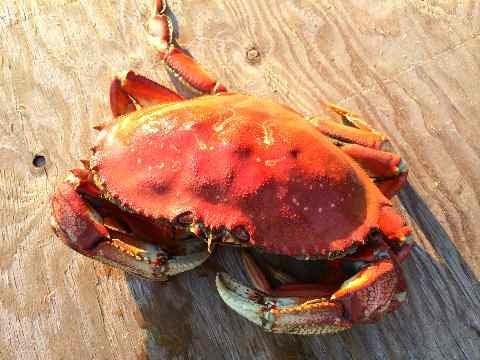 Nice to eat though, boiled with a little butter. I sleep better with a full belly. Its off to SCAMP Camp again, the clinic has given me a conditional clearance, in practical terms that means that I'm ok and my health insurance is valid as long as I dont try running an iron man or competing in a 6 day cycle race. Good, I doubt that I'd be putting either of those on my list of things to do anyway. So its pack, shut the ship down, electrical and gas off ( thats the lpg for cooking type gas) . Both diesel tanks taps off, shore power disconnected, seacocks off, fridge emptied and propped open mooring lines doubled up and fenders all checked. Lock 'er up and I'm on the bus. 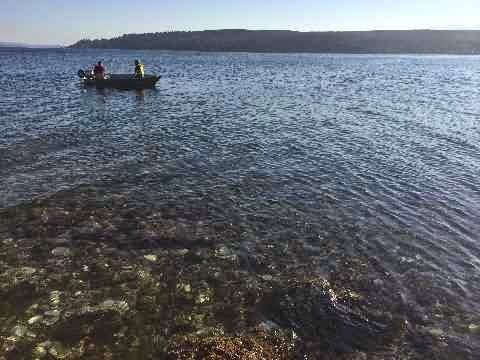 I'll be posting regularly while away, will introduce some friends, show you whats happening at SCAMP Skills ( sailing ) and SCAMP CAMP ( Building) classes, show off any really nice boats I find and "talk" about whats happening in Port Ludlow where I'll be staying, and Port Townsend where the classes are being run.